We’d love your help. 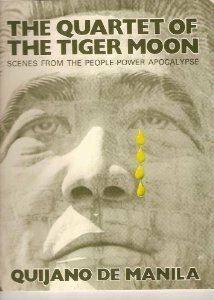 Let us know what’s wrong with this preview of The Quartet Of The Tiger Moon by Nick Joaquín. To ask other readers questions about The Quartet Of The Tiger Moon, please sign up. Nicomedes Márquez Joaquín (May 4, 1917–April 29, 2004) was a Filipino writer, historian and journalist, best known for his short stories and novels in the English language. He also wrote using the pen name Quijano de Manila. Joaquin was conferred the rank and title of National Artist of the Philippines for Literature. After Jose Rizal and Claro M. Recto, both writers in spanish language, he is cons Nicomedes Márquez Joaquín (May 4, 1917–April 29, 2004) was a Filipino writer, historian and journalist, best known for his short stories and novels in the English language. He also wrote using the pen name Quijano de Manila. Joaquin was conferred the rank and title of National Artist of the Philippines for Literature. After Jose Rizal and Claro M. Recto, both writers in spanish language, he is considered the third most important Filipino writer (but the most important writer writing in the English language).